Red Label and Yellow Label tents (except the Enan) and the Altai Basic UL are shipped with standard bags, while Black Label tents and the Atlas Basic and Altai Basic XP come with XP tent bags. A unique accessory for our tunnel tents, the Sled Pack is designed for winter trips with gear sleds (or dog sleds). It allows you to strike your tent quickly and pack it into an easy-to-manage package. Very light yet very strong, our V-Peg is made from hardened aluminum, and it has specifically engineered thick yet light spine and sides to prevent bending. Its "V" cross section provides a fine balance of penetration in hard ground and holding capability in looser soil. Anodized a highly visible gold, the V-peg also has an integrated string loop for easy removal from the ground. Our Y-Peg is exceptionally strong yet quite lightweight, and its "Y" profile gives both excellent penetration in hard ground and plenty of surface area for reliable hold in softer conditions. Both because of its shape and its durable, hardened aluminum body, the sturdy Y-Peg can be hammered into hard ground. Its bright, gold anodized color makes it easy to see, and an attached string loop provides for easy removal. Our lightest peg, the new, hardened aluminum Y-Peg UL has a “Y” cross-section similar to our Y-Peg, but in a smaller (and lighter) package. While not quite as robust as the larger Y-Peg, it offers a great balance of hard ground penetration and soft ground holding power. 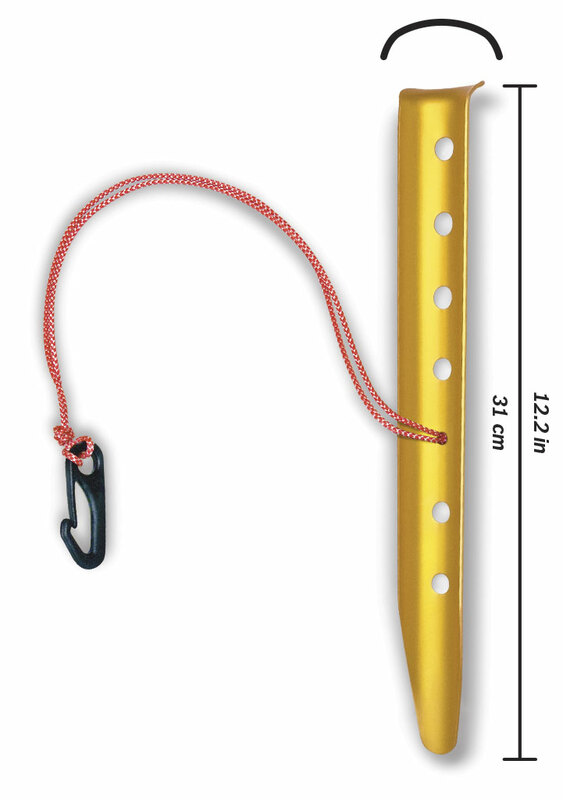 Its gold anodizing makes it highly visible, and the attached string loop makes it easier to pull it from the ground. Made from solid Titanium, the super strong yet lightweight Stinger can easily handle being pounded into hard ground, and its integrated string loop makes for easy removal. So-named for its fluted square cross-section, our new X-Peg is built from extruded, then anodized, aluminum, and is designed to take on the most demanding usage. The X-peg’s 30 cm (12 in) length and burly construction make it an ideal option when you need maximum penetration and holding power in hard ground, and it is stout enough to be hammered into the ground, even with a light sledge. An open, upside down “L” hook near the top of the peg allows quick securing of guy lines, and a separate closed ring has an attached string loop to make removing the peg easier. Available for all models except the Atlas and Altai, these tough ground sheets help both to protect your tent’s floor from abrasion and to keep ground moisture from rising in the vestibule. Black and Red Label tents’ Footprints cover the full area of the outer tent. Yellow Label tents’ Footprints cover the inner tent area only, except for the Enan, whose Footprint covers the full area of the outer tent. All the poles listed below are our current DAC featherlite NSL poles. 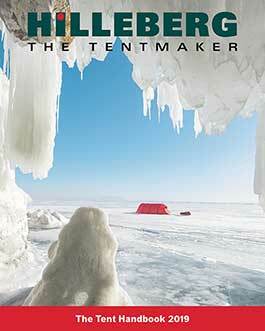 If you have an older tent and aren't sure what poles you have please click here. The 19.5 mm Tarp Pole is a simple, lightweight, standing-height pole designed for use with Tarps and other simple shelters (it works superbly with our Altai). 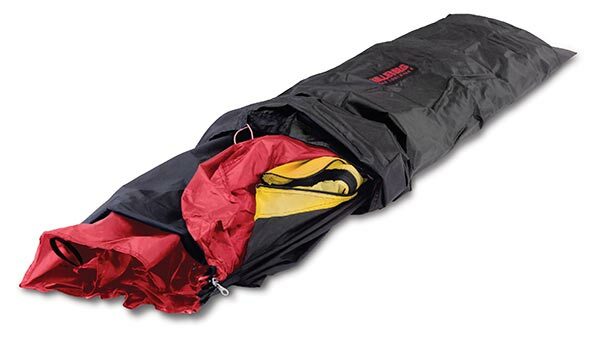 It folds down to approximately 52.5 cm (20.7"), and, thanks to a two-part bottom section with spring-loaded buttons, the Tarp Pole can extend from 186 cm (73.2") to 214 cm (84.3") in 7 cm (2.8") increments. It also boasts a reversible, screw-in tip that can be used with fabric pockets (such as on the Altai), or with rings or loops (as on the Tarps). Extra pole holders are needed when you want to pitch the inner tent by itself. Link these to the corners of the inner, and place the ends of the poles into them.